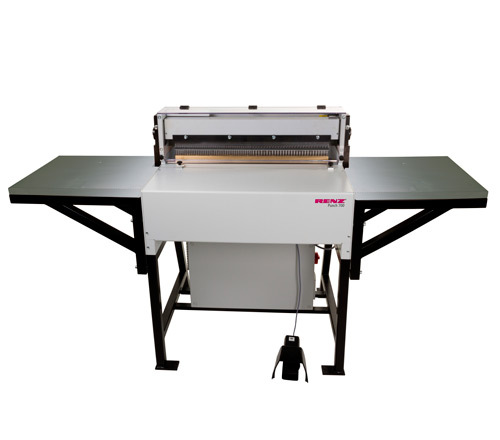 Heavy duty machine for continuous punching and perforating up to 700 mm (28″) punching width. Easily operated by a foot switch or micro switch. Can be operated while sitting or standing. Horizontal paper insertion guarantees punching accuracy on wide formats. Quick and easy die change in just a few minutes. Punching dies for wire comb binding, plastic and spiral binding are available in QSA execution (QSA quick size adjustment = quick cancellation of punch pins). Therefore it is not necessary to remove the die for format changes. Due to the wide punching width, 2 part dies can be used allowing punching of books and calendars. Therefore, the investment of a second die is saved. Significantly, the machine can be configured with two 350 mm dies side by side; one in 3:1 pitch and one in 2:1 pitch therefore negating the need to die change when moving between pitches. Continuous height adjustment for reground dies, up to 15 mm max. The proven design guarantees a long life span. heavy duty machine for continuous work. fast and easy changing of punching dies in just a few minutes. punching dies of most competitive manufacturer can be used by changing the mounting adapter. fast format setting with QSA dies. Electrical connection: 230/400 V / 50 Hz / 2.2 kWon request3 x 240 V / 60 Cc.